Can you catch the sparkly pom poms? A fun fine motor activity for developing grip strength and motor control. 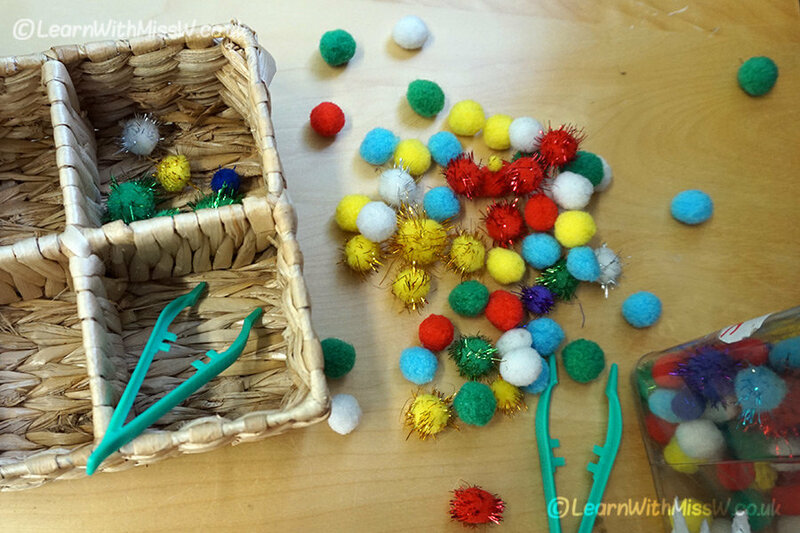 Using the tweezers, children collect all the sparkly pom poms and transfer them from the tub into the basket. It’s even better to use a tub with a tricky lid, so that getting the lid off also becomes part of the challenge! I bought some very cheap plastic tweezers and unfortunately they break quite easily if trodden on. Fingers crossed my class are able to look after these as they are the last 2 pairs. You do get lovely, but more expensive, occupational therapy tweezers that provide more resistance and are much more durable. The tweezers could be used for any collecting, sorting or precise activity, such as sorting buttons, transferring sequins from one container to another or putting pegs in peg boards. The possibilities really are endless. Children will naturally use their dominant hand, but it might be good practice and a bit of a fun challenge to try using their non-dominant hand some of the time.